If you have finally decided to move out of your 10-year-old-house and shift to a new state, then KUDOS to that! You are a brave man, as house shifting can be a very difficult task to manage. It is a delicate matter and requires a decent amount of experience, immaculate packaging techniques and off-course appropriate planning. If not, then, let’s just say that you’re going to have a really tough time packaging, labelling, loading/unloading and handling them without causing damage to it. A clear plan of action is what you need to come up first, particularly if you are planning to DIY. But then again, Why Are You Opting For DIY, Especially If There Are So Many Reputed Moving Companies Ready To Come To Your Help At Just A Call? ‘Professional Relocation Companies Will Send Out Their Experts To Handle All Your Valuable/Heavy/Fragile Items.’ Be it the packing, providing it the right amount of cushioning, using bubble wraps and plastic sheets to cover them up and loading, they will not even let a hair-line crack occur on them. However, these experts are humans and accidents always happen when performing such dicey shifting operations. ‘If Something As Such Happens, These Removal Companies Will Compensate For The Loss With Their Damage Insurance Coverage Schemes.‘ This means that you don’t need to worry about spending any extra money other than the package rates. Their Interstate Relocation Packages Will Always Be Set As Per The Standard Rates In The Industry. To determine the exact cost of your shift, these experts will come down to your place and perform an inspection. By getting a clear picture of the quantity, nature of your household items and also the relocation distance; they will give you their price quotes – which, much to your delight will be rational and budget-convenient. The best relocation companies in Perth will never make you pay more than needed, and that is great news on your part! Plus there are many other perks of hiring pro removalists for your interstate shifting- like their Experience, Ability to Tackle Massive/Heavy/Fragile Items and Proficiency to Get the Job Promptly. Keeping These In Mind, The First And Foremost Thing To Include In Your Things To Do Checklist Is To Hire Acknowledged And Experienced Removal Experts For Your Big Shift. The next factor is to relocate with things that you will need (and not what you think you’ll need). To gather some extra cash, you can sell off those unneeded items online. Shut down your other household services such as electricity, water, gas, phone, and internet connection. Along with that, you should alter your address by informing your post office. That will ensure that all your important letter, bills and deliveries get dispatched to your new location. If you have school going children, then you should sort out their new school options. The last thing you want is to miss out on the admission date and make your kids sit at home ideally for a month or more. Lastly, you should remember to obtain your family medical records from your existing doctor, so that it’s easier for you to get registered with a qualified doctor in that new location. 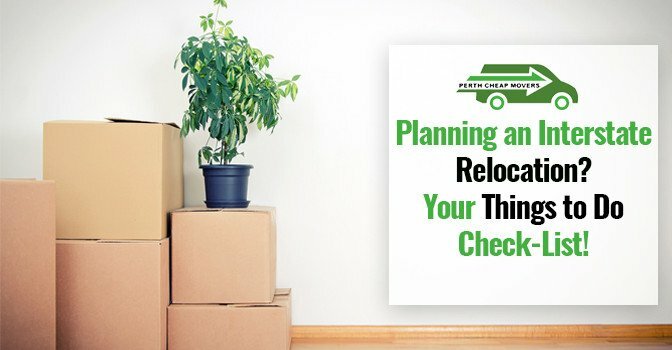 Remember each of these points as your things to do checklist – particularly the first one -hiring quality relocation companies for hassle-free and budget-friendly removals. That’s the most crucial point of all, and if you take care of that first-up, then all the other points can be done with a peace of mind. So, Sort Out Your Relocation Company Based On Their Market And Customer Reputation And Make Your Interstate Shift Headache-Free! If you are in a hurry to move out, then you can speak to the experts at ‘Perth Cheap Movers’ and also know their estimates.